How quickly will changes I make in the app appear in the web interface and vice versa? I lost my mobile phone. How do you protect my data against unauthorized access? Who should I direct my questions and suggestions to? The complete range of Yandex.Direct tools is available in the web interface and through Direct Commander. Changes made in the app appear in the web interface immediately (as soon as you open or refresh that page). The time it takes to activate changes is the same as in the web interface: for example, a new CPC will take effect within 10 minutes on average. To refresh data on the app screen, drag the screen downward with your finger. The app does not store your Yandex.Direct username and password. Instead, it gets a special token that gives it permission to access your data via the Yandex.Direct application programming interface (API). You may revoke this token at any time, which in turn revokes the app's access rights. Go to the Direct web interface, find the API page, and tap the Get API access link. Accept the API user agreement. On the access control page, go to the My applications tab and tap the link to the OAuth service page. On the OAuth service page for the Yandex.Direct app, tap Delete. From then on no one will be able to use the app to access your data in Yandex.Direct. In the future you can install and use the Yandex.Direct app on another device. Your newly installed app will get a new token. The instance of the app that you had previously will not get that token and access to it will remain prohibited. 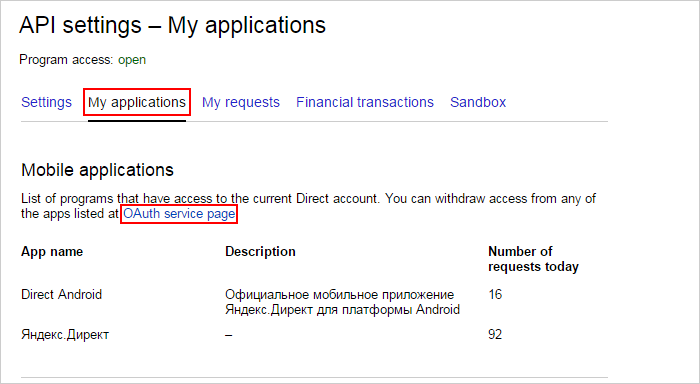 If you have issues working with the app or want to share your ideas, please write to us at appdirect@support.yandex.ru. We read all our emails and take your suggestions into account when updating the app. What can the app do?What devices does the app work on?How quickly will changes I make in the app appear in the web interface and vice versa?I lost my mobile phone. How do you protect my data against unauthorized access?Who should I direct my questions and suggestions to?